Save the dates July 15-16, 2011 for a visit to Kalaupapa National Historical Park! 1. Our host is Scott Williams, Museum Curator, who will provide an orientation & guide our group through the collections, cemetery and church, with some hands on service activities. 2. We’ll hike down Fri morning 7/15 and hike back up Sat afternoon 7/16. 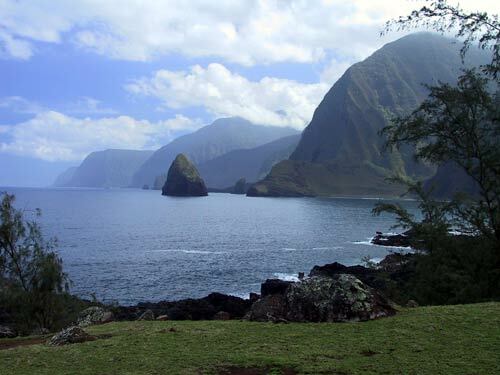 The 3 mile trail scales 1,600 feet of vertical Molokai north shore sea cliffs. Hiking time on the trail for a physically fit individual is estimated at 1-1 1/2 hours down and 1 1/2-2 hours back up. 3. We’ll overnite on Friday in Kalaupapa in Park housing. There will be kitchen facilities & linen but we will need to bring our food. Housing: There is no set fee but a voluntary donation will be appreciated. Transportation estimate: Honolulu/Hoolehua roundtrip airfare via Island Air, $145. Ground transportation from Hoolehua airport to trailhead & return: to be determined. Honolulu/Kalaupapa roundtrip airfare via Pacific Wings, $501 (this is not a typo). This is not a commitment; a head count will help us with planning & logistics. We can accommodate a very limited number of members. More information & a registration form will be available in May. Sorry, I won’t be able to make the trip. Have fun!